It was a completely new bouquet of aromas that hit my senses as soon as I opened a packet of Koli masala given to me by Anita. The creator of this Koli masala blend is Anjali Koli and she had sent packets of this masala for Anita and me. That was long time ago and I used the masala first for a shrimp curry and then a liver curry that I mostly cook for dinner. I was pleased by the results and experimented with the spice blend a bit more, asked Anjali more about the recipes she uses it for and got to know she is a vegetarian. She sent me another large pack of Koli masala that would last me another 6 months or so even after sharing some with a friend. After talking to Anjali, I started using this Koli masala for vegetables more and was never disappointed. It is a good change for our palate so used to everyday curry powder and the more aromatic garam masala. There is a distinct whiff of patharphool or dagad phool or Chhadeela (the lichen Parmelia perlata) and star anise in this spice blend and chilly peppers are also included so I don't add any chilly powder in the curries when I use it. One of the most surprisingly good results I got from Moongrey (Rat tailed radish) ki subzi. 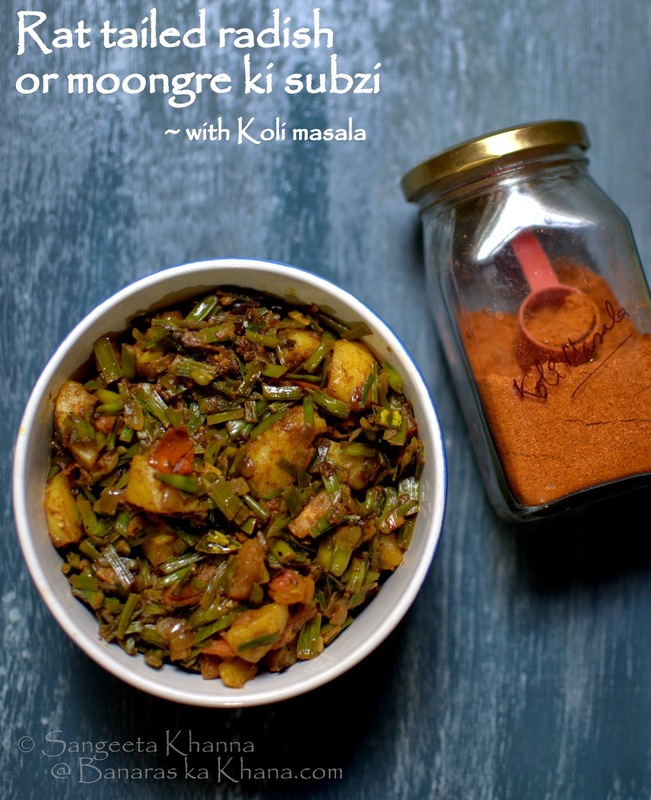 So much so that I would always want moongrey cooked with Koli masala now, though I like the rat tailed radish salads and moongrey stir fry that I always do. Here is the simple recipe with moongrey and potatoes. Heat mustard oil and tip in the ginger and garlic. Fry till fragrant. Dissolve the powdered spices in 2 tbsp water and pour into the pan, fry till aromatic, for a minute approximately. Add the potato cubes, fry for about 2 minutes stirring all the while on medium heat. Add the tomatoes and salt and cook till mushy. Add the moongrey and keep stirring the mix on low flame till the delicate radish fruits get cooked and soft. Serve hot or warm with roti or daal chawal meals. 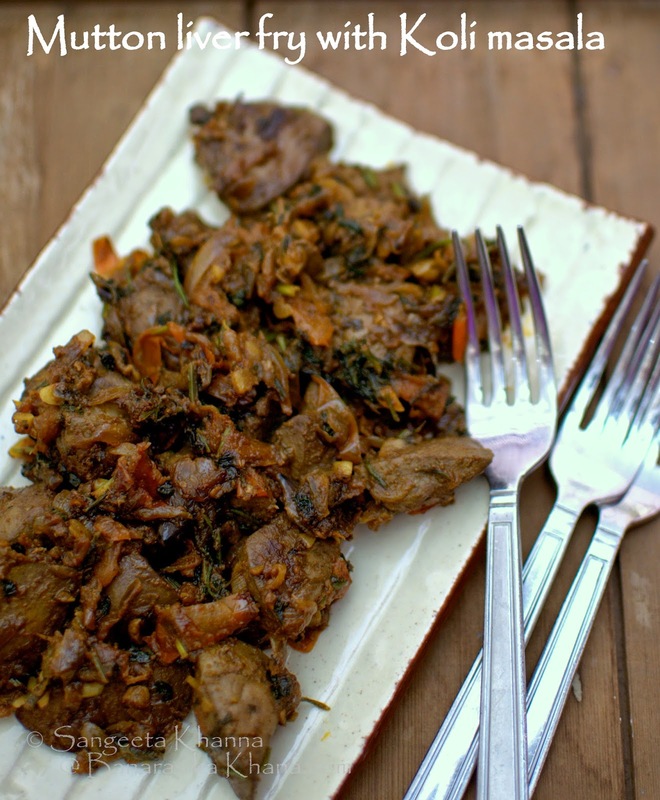 This mutton liver fry was the most frequent during winter days, mostly cooked for dinner along with millet rotis. It used to be a comforting warming meal, but now as it has gotten so hot here in Delhi, I just fry the mutton liver with salt and pepper in a little ghee and serve with some parwal ka chokha or lauki ki subzi. To make this mutton liver with Koli masala, Just cook the ginger garlic in mustard oil first, dissolve powdered spices in a little water and add. Cook briefly, add tomatoes, loads of dhaniya patta with stems and salt to taste and cook till mushy. Add liver and cook for about 20 minutes covered, stirring once in a while. 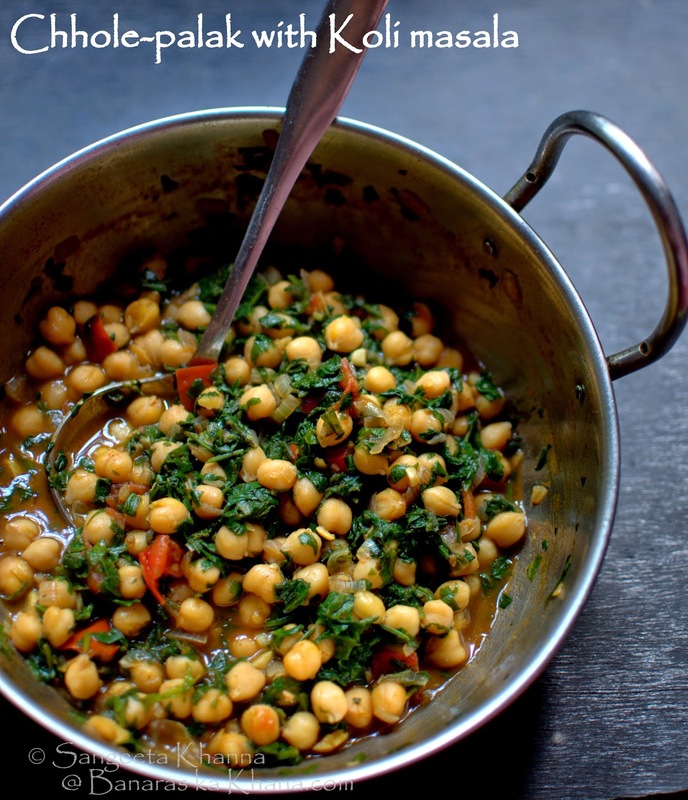 Another quick curry I do with Koli masala is the chickpeas and spinach curry. The Koli masala and tomatoes and cooked just like the liver curry, then I add the spinach and pressure cooked chickpeas. Cook this mix till the flavours blend. 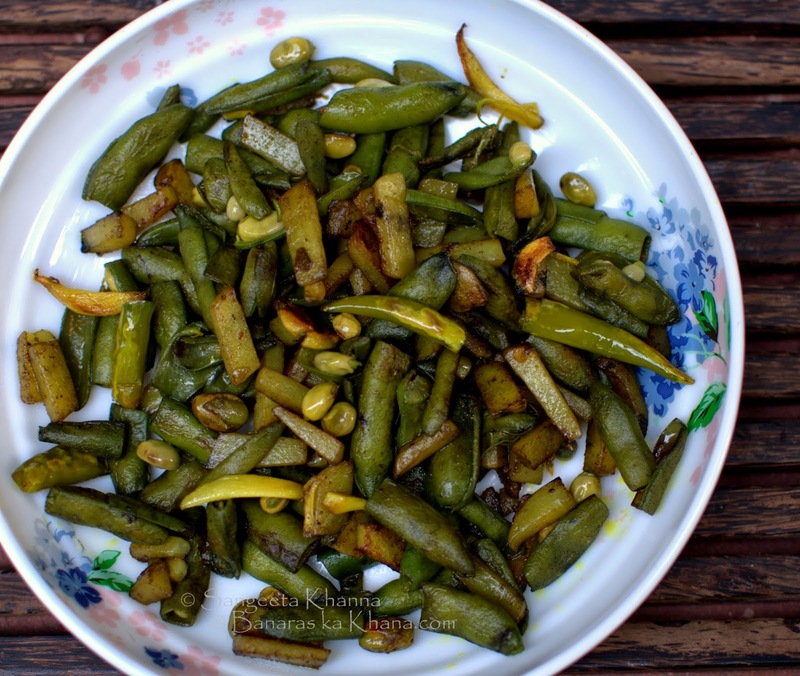 A very unusual chhole palak that goes well with either plain boiled rice or plain roti. Interestingly, a few vegetables which the husband normally dislikes, were made using this Koli masala and he loved them. Bakla (fava beans) ki subzi is one acid test when trying a new spice blend. He loved this Bakla ki subzi with Koli masala. I normally cook bakla with potatoes and tomatoes and the everyday curry powder, have posted a really easy recipe of bakla here, this one with Koli masala was a nice twist. Remove stems and string the fava beans. Cut into halves if they are too large. Heat mustard oil in a kadhai and tip in the chopped garlic and slice onions followed by batons of potato. Stir fry for about 2-3 minutes. Add the fava beans and cook for another 5 minutes. Add the koli masala and mix well. Keep stirring for about a minute on low flame. Add the sliced tomatoes and salt and keep stirring and cooking till the tomatoes get a bit mushy. Add half a cup of water, cover the pan and simmer for about 5 minutes or till the vegetables are cooked through. Serve hot with roti and daal or even with plain boiled rice. I cook bakla with slivers of potato sometimes, just with a tempering of green chillies and sliced garlic cloves. Essentially in mustard oil. I dunk everything at once in hot mustard oil along with salt to taste and cook them all on medium heat till garlic slices are browned well, potato slivers are nice and golden and bakla is cooked through. This time I sprinkled a little Koli masala and it tasted good. Just take care to cook the vegetables after adding spice blend well for a few seconds in this one. 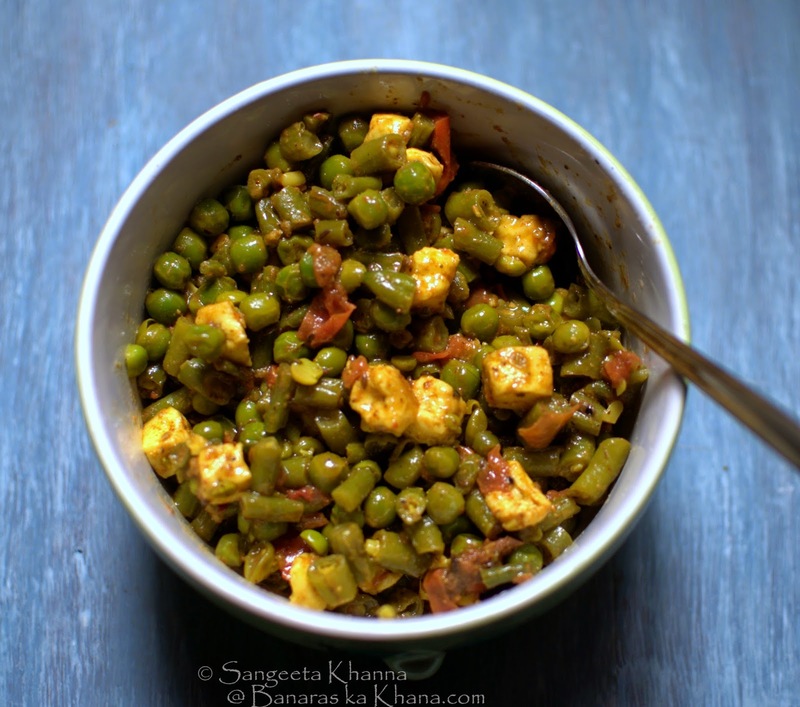 Another try was with chopped green beans (French beans) and peas with tomatoes, with added paneer cubes. This one was a dry subzi made for Arvind's lunch box. Heat mustard oil and tip in the ginger and garlic. Let them fry till fragrant. Add the tomatoes and salt and cook till mushy. Add the Koli masala, turmeric powder and pepper powder and cook for a few seconds. Add the peas and chopped beans, cover and cook till done. Stir in between to coat them well with the spices. Add paneer cubes, mix well and cook covered for a couple of minutes. Serve hot with roti or daal chawal or as desired. Just take care to add the Koli masala at a stage when it needs a bit of frying or cooking at medium flame so the spice blend gets cooked well. It is a robustly flavoured spice blend and stays well in the curry, does not evaporate like aromatic gram masala. 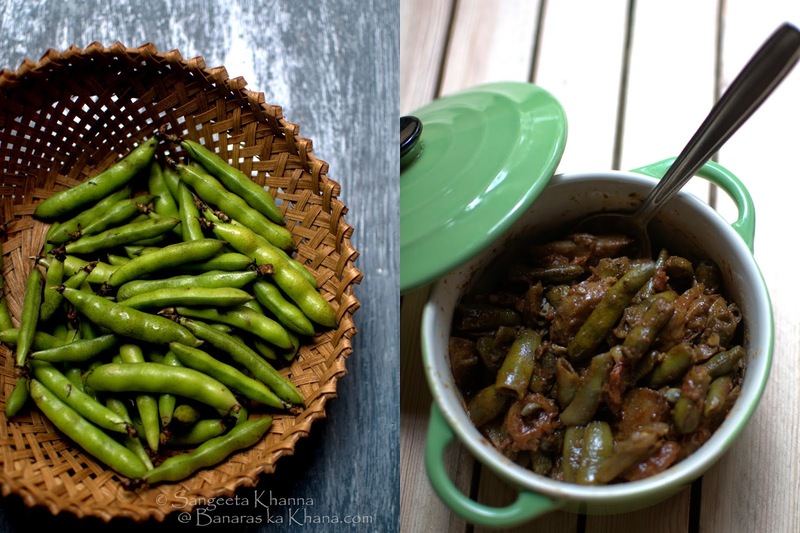 I found that most of the vegetables take on the flavours well, especially in the presence of tomatoes or tamarind. The good thing is, you can buy the Koli masala at Anjali's website. The spices are milled under her supervision and I found the quality really good. I never buy or use any packaged spice blends but this one would be an exception. This is home made. Wow that so you Sangeeta thorough as ever, like a true researcher you did the length and breadth of this my Koli masala give a try with fish which is the one thing staple in the Koli community. Thank you for this post! Love the shot of Chhole Palak.. very inviting ! !